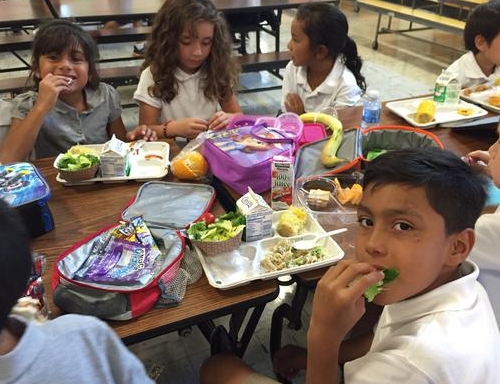 Congress considers reauthorization of the Healthy, Hunger-free Kids Act of 2010. If fresh fruits and vegetables are made available, children will choose to eat them. Several grade school students set down their forks to eat their green salad, picking up individual lettuce leaves with their fingers and pushing them into their mouths. 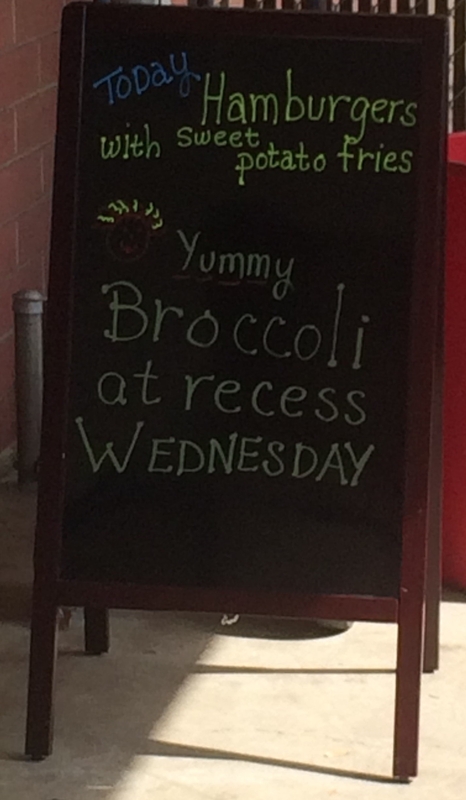 Not that I was there to judge for style, it was just an observation as I looked around the cafeteria festooned in colorful hand-cut paper banners to see how many of the kids had taken a salad. The youngsters are required to take at least a half-cup serving of fresh fruits or vegetables as part of a healthful meal to meet national nutrition standards, but I noticed they were voluntarily eating the fresh leafy greens and orange slices. 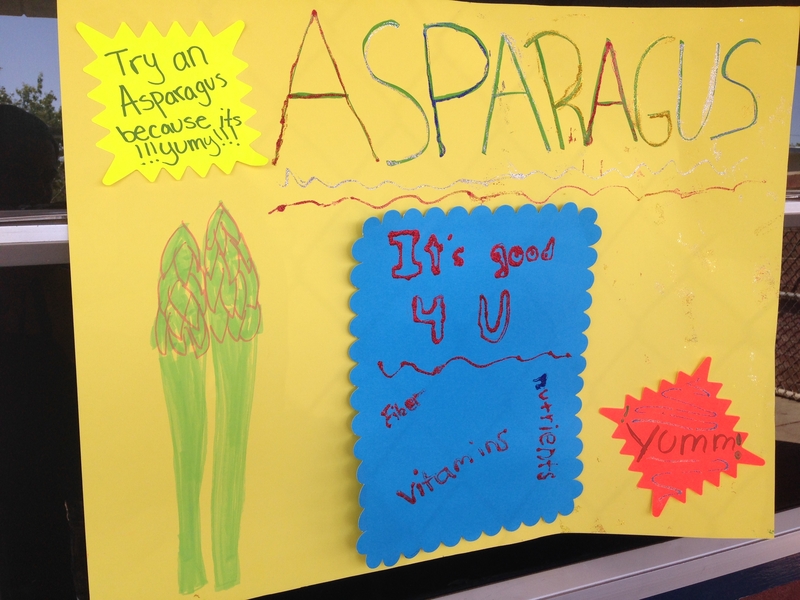 The children had selected the food themselves from a new serving line, which was made possible by a grant from the USDA aimed at encouraging children to eat healthier school lunches. 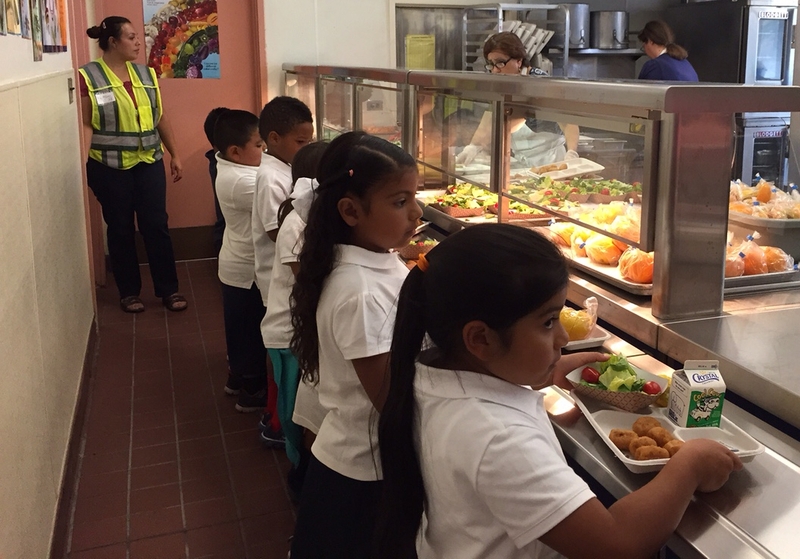 U.S. Department of Agriculture has been providing a new round of grants since 2013 to upgrade kitchen and cafeteria equipment. 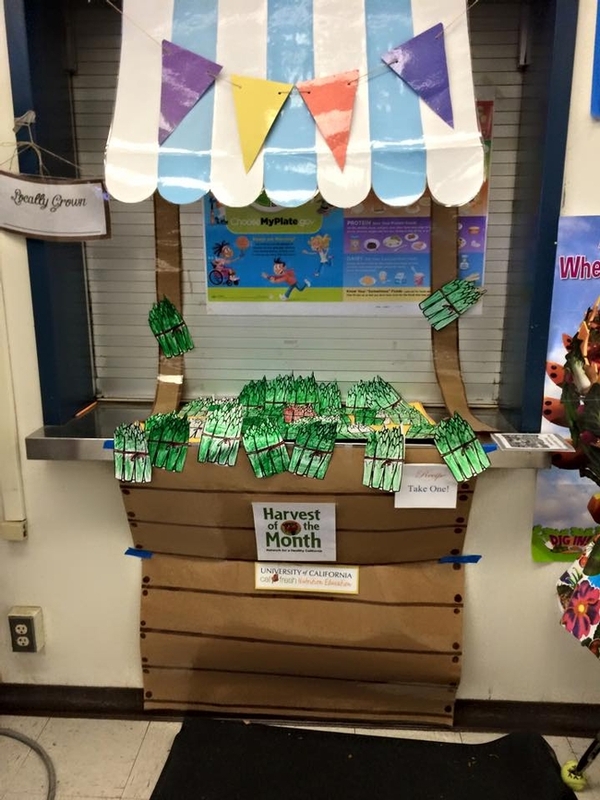 Ygnacio Valley Elementary School is in Mount Diablo Unified School District, which received a USDA grant. About one-third of children in California are overweight or obese, which is associated with serious health risks. 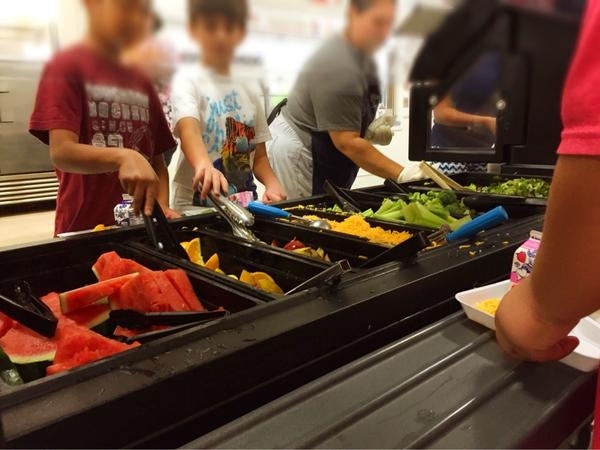 According to The Pew Charitable Trusts, 93 percent of school districts in California, and 88 percent nationwide, need at least one piece of equipment to better serve students nutritious foods. Students serve themselves in Ygnacio Valley Elementary School's new serving line. When the children select their own food, less food gets thrown away. 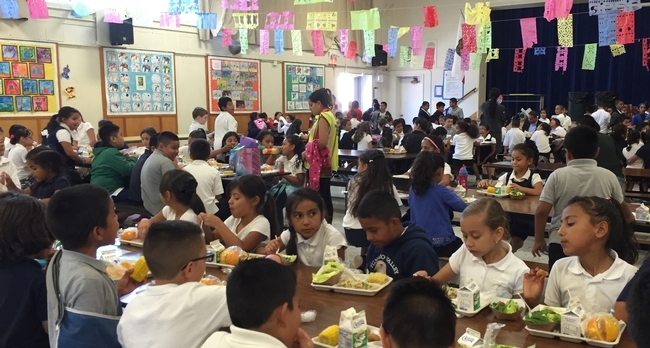 With Pew funding, the Nutrition Policy Institute in the University of California's Division of Agriculture and Natural Resources is conducting case studies of selected California schools, including Ygnacio Valley Elementary School, to evaluate the effects of the USDA grants program. Kenneth Hecht, director of policy for the Nutrition Policy Institute organized the Sept. 3 visit to the Mount Diablo Unified School District for Congressman Mark DeSaulnier and USDA executives to see the improvements. A student's lunch tray. Photo by Deanna Davis. The school district serves about 20,000 meals each day, nearly half of which (46.2 percent) are free or reduced price for children from low-income families. By replacing a refrigerator bought in 1973 with a new walk-in refrigerator, the central kitchen is able to store and serve twice as much fresh produce while saving energy and energy costs, said Anna Fisher, director of Food and Nutrition Services for Mount Diablo Unified. The new serving line allows for food to be displayed so the children can select their own food, whereas before, each tray was filled by a server and handed to the students. 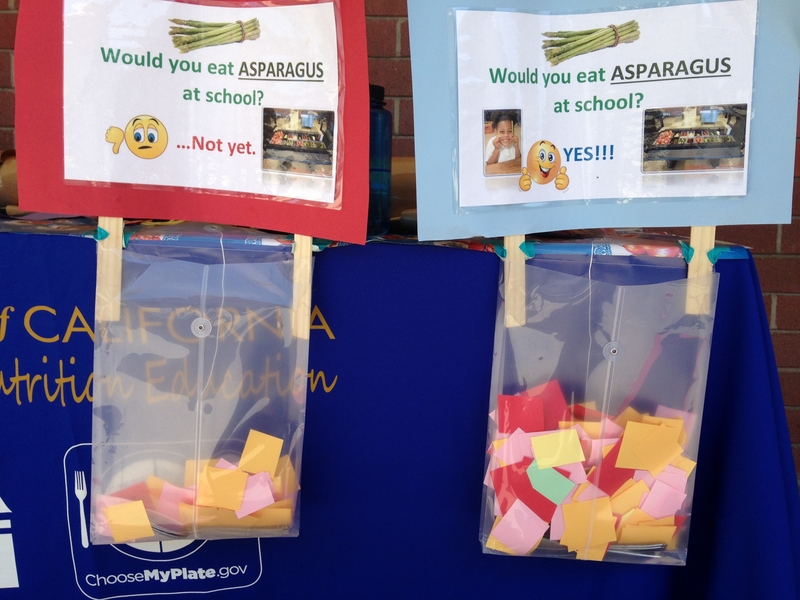 “We've seen that when the children select their own food, less food gets thrown away,” said Fisher. 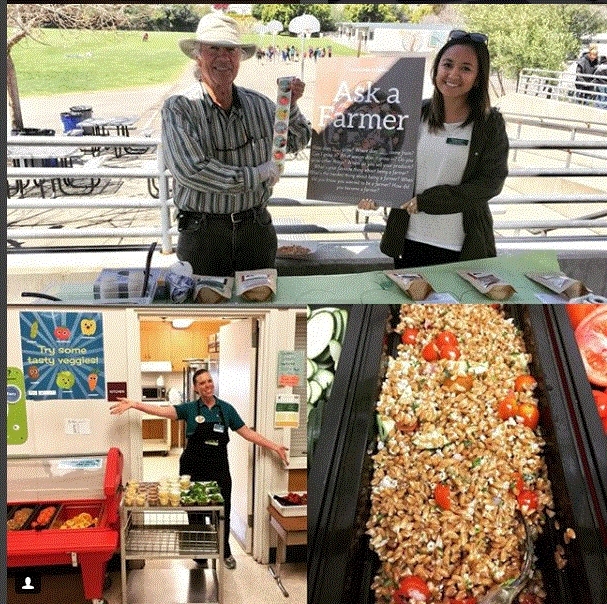 “The examples we are seeing at Mount Diablo Unified School District are perfect illustrations of what these USDA grants can do, from the procurement of food to serving healthy meals to children,” said Hecht. 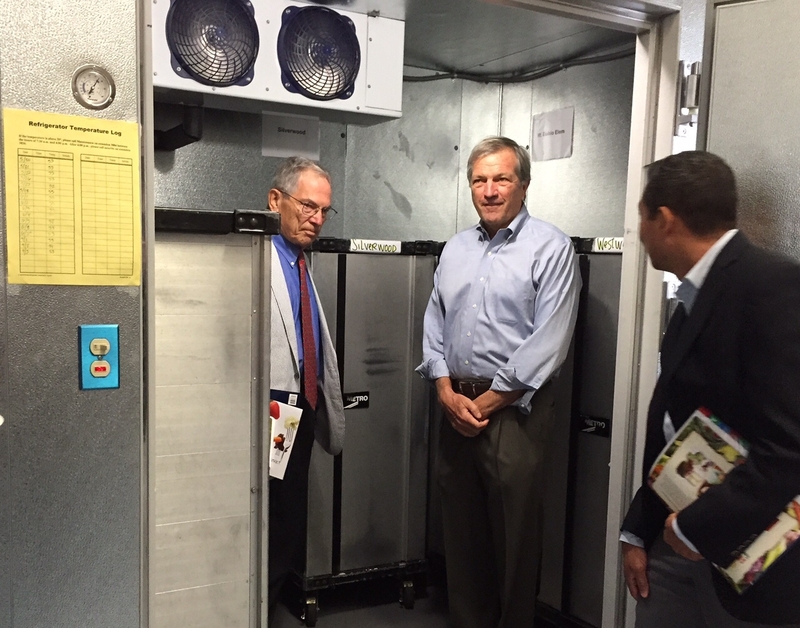 Ken Hecht, left, Mark DeSaulnier, center, and Jesus Mendoza, USDA Western Region administrator, check out the new walk-in refrigerator. 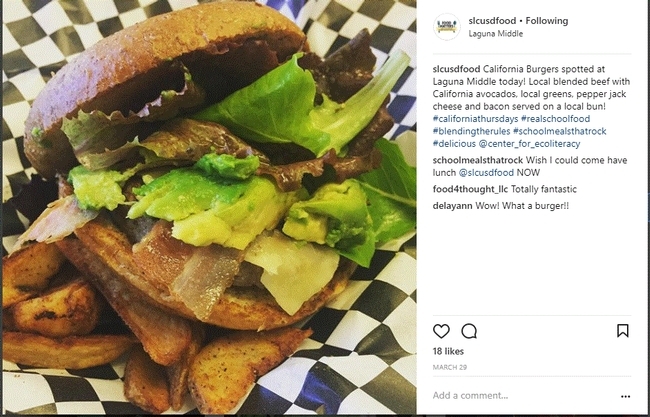 Congressman DeSaulnier, who ate lunch with the students, is sponsoring the School Food Modernization Act (HR 3316) to continue and strengthen the USDA grants program. 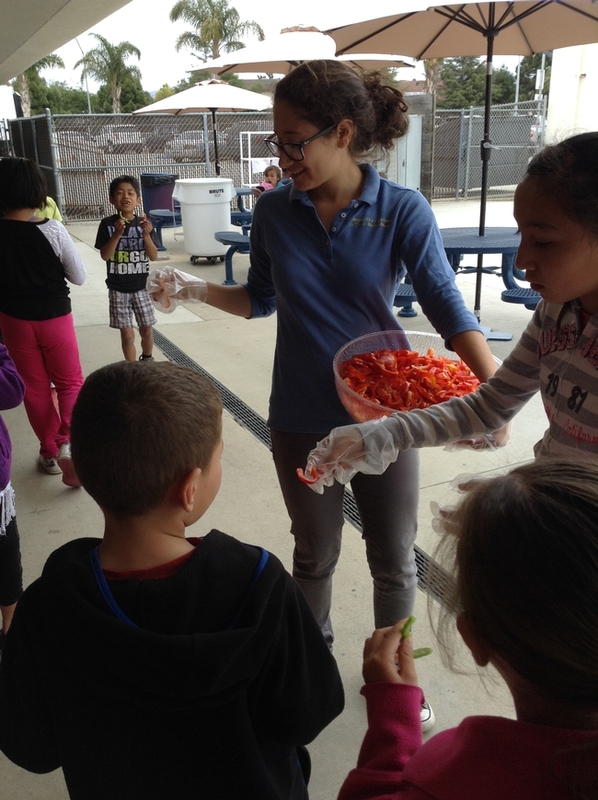 Another piece of federal legislation aimed at improving child nutrition is the Healthy, Hunger-Free Kids Act of 2010, which includes farm to school support and expires on Sept. 30, 2015. “This fall is a pivotal time for the future of Farm to School programs across the country,” said Gail Feenstra, deputy director of the UC Sustainable Agriculture Research and Education Program (SAREP) in the UC Division of Agriculture and Natural Resources. 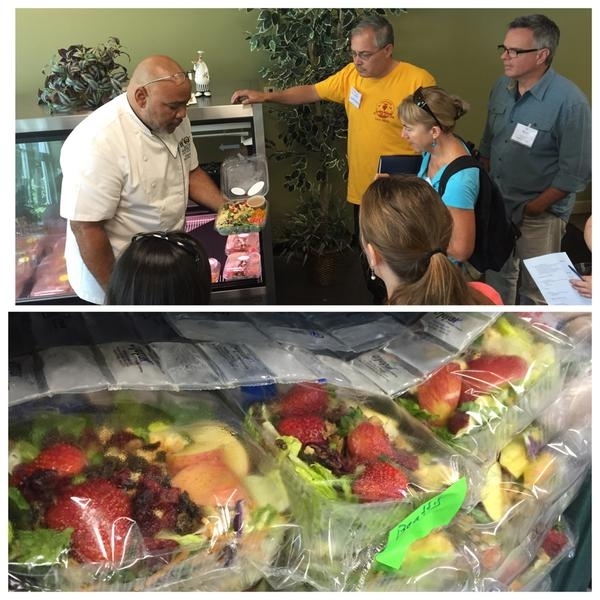 RUSD's Chef Ryan shows visitors his summer salad made fresh from local produce. On Sept. 2, SAREP and the Urban Environmental Policy Institute at Occidental College hosted a tour of farm-to-school sites in the Riverside Unified School District where Los Angeles-area participants were able to meet with farmers, school chefs, food service directors, advocates, researchers and elementary students and to witness firsthand the benefits and challenges of providing farm-fresh fruits and vegetables to Southern California schoolchildren. 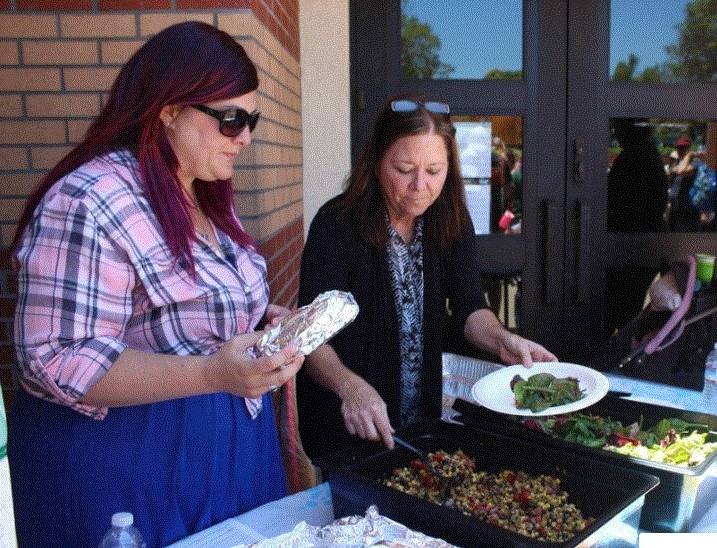 Riverside schools have transitioned from heating prepackaged meals to buying local produce and preparing fresh food on-site. According to Kirsten Roloson, director of Nutrition Services, and Adleit Asi, operations manager, Riverside Unified now buys $400,000 worth of produce from local farmers. One farmer, Bob Knight, who supplies oranges and other produce to Riverside Unified, said he's making five to seven times more money selling to schools than he did before. “Farm-to-school programs increase access to fresh, healthy produce among school children while also supporting local farms,” said Feenstra. 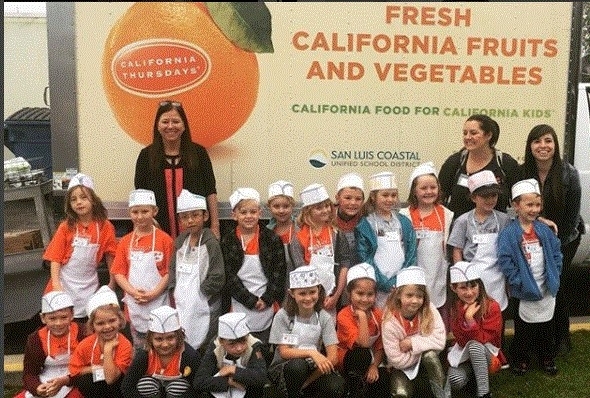 In California, she noted that 2,626 schools participate in farm-to-school programs, serving 1.8 million students and buying more than $51 million in produce from local California farmers. Feenstra will be leading a similar farm-to-school tour for policymakers in Sacramento on Sept. 29. 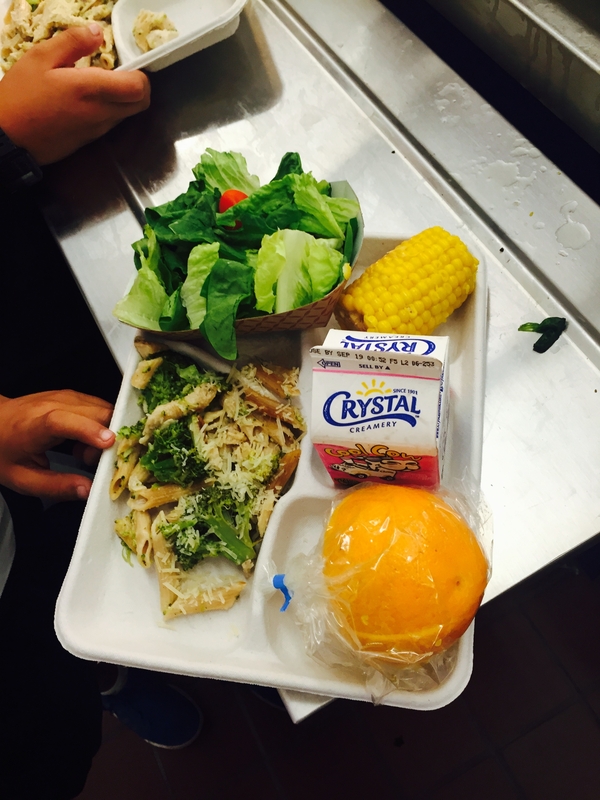 Riverside Unified School District's produce is purchased fresh and whole from local farms and prepared in-house. 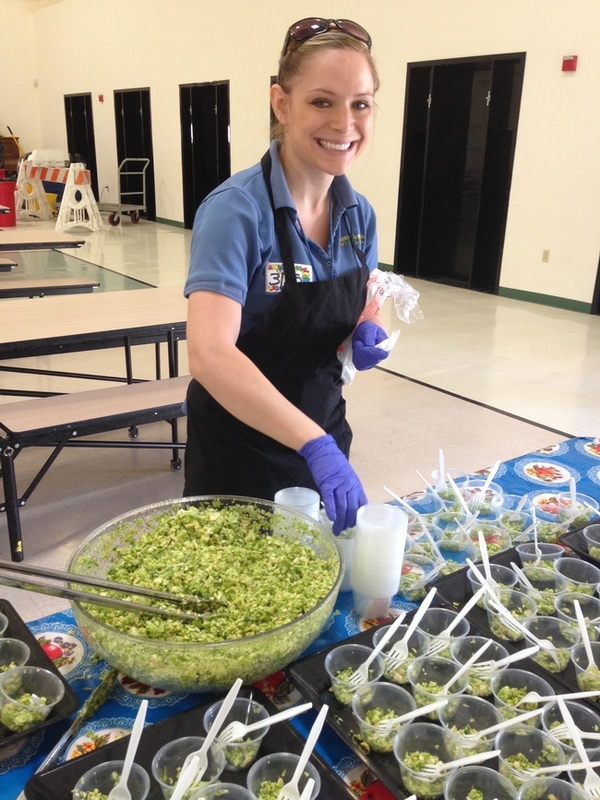 "With new equipment and fresh produce, schools can prepare healthy and more appealing school meals that may be the most nutritious meal a child receives that day," Hecht said. Whether children eat with forks or fingers, the nutritional quality of the food they eat can affect their lives, long term. The University of California Global Food Initiative aims to put the world on a path to sustainably and nutritiously feed itself.  By building on existing efforts and creating new collaborations among UC's 10 campuses, affiliated national laboratories and the Division of Agriculture and Natural Resources, the initiative will develop and export solutions for food security, health and sustainability throughout California, the United States and the world.